The Charities Act gives the Commission the power to link two or more closely related charities 'for all or any purposes of this Act'. In practice, we will usually link charities for both registration and accounting purposes and we will occasionally link charities for registration purposes only. We do not link charities for any other purposes of the Act. submit only one Annual Return to the Commission. the charities qualify to be linked under the terms of sections 12(1) or 12(2) of the Charities Act. That is, they have the same trustees and/or one or more of the charities is established for any special purposes of, or in connection with, another (ie the charities are 'connected'). In all but exceptional circumstances we expect trustees to apply for linking by completing the online application form. Using the application form will ensure that the trustees are aware of what linking will and will not achieve and will also ensure that the trustees provide us with all the information necessary to make the link. if we make a further direction bringing the link to an end. We will do this if the trustees ask us to because they do not want the link to continue. bring a link to an end, when appropriate. B2 What do we do when asked to advise trustees who are considering linking their charities? B2.5 What if we are making a Scheme for the charity? B3 What do we do once we receive a completed application form? B8.1 Why might charities unlink and when might a link come to an end? F2 What does linking do? F3 What does linking not do? F4 What kinds of charities can link? F5 What characteristics must charities share to be able to link? F7 Can we link special trusts? F8 Can we link excepted charities? F9 Can we link unregistered charities? F10 Do we link exempt charities? F11 Can we link a charity that holds PE? F12 How do charities apply to link? F13 Who can apply to link charities? F14 Do all applications have to be made using the online form? F15 Can we include a linking direction in a Scheme? F16 Which charity should be the reporting charity? F17 How are linked charities dealt with in the reporting charity's accounts? F18 How will linked charities appear on the Register? F19 Can a link be brought to an end? The Commission has the power, under sections 12(1) & 12(2) of the Charities Act, to link two or more charities. This is intended to reduce the administrative burden on charities and the Commission. We will link charities on the request of the charities' trustees, as long as the charities qualify to be linked and we are satisfied that the trustees are aware of the limitations of linking. In all but exceptional circumstances we will only link charities where the trustees have applied using the online application form. When charities are linked, the trustees must take care to ensure that any permanent endowment is properly protected. This is particularly an issue where a charitable company is linked to a charity that holds permanent endowment. Where we link charities we will usually do this for both registration and accounting purposes. We do, occasionally, link charities for registration purposes only. We do not link charities for accounting purposes only, because we expect each separately registered charity to file separate annual returns and, where they meet the income requirement, file separate annual accounts and reports. A link will cease to have effect if the charities no longer qualify under sections 12(1) or 12(2) or if we make a further direction bringing the link to an end, usually on the request of the trustees of the linked charity. When we are approached by trustees who are proposing to link two or more charities, or where a proposed linking follows on from an earlier Commission case, we should refer the trustees to our online application form. This sets out the benefits and limitations of linking and will help the trustees to decide if linking is an appropriate way to achieve what they are hoping for. We should explain that, apart from in exceptional circumstances (see B2.2), we will only consider linking the charities where the trustees have satisfactorily completed and submitted the online application form. Completing the form will ensure that we are given all the necessary information to consider linking the charities. Because the issues surrounding the linking of NHS charities are different to non-NHS charities, the form is not suitable for use by NHS charities. These cases should be referred to the team dealing with NHS charities for further action. If NHS charities try to complete the form, there is a question asking if any of the charities are NHS charities, answering 'yes' to this will open an email template that can be used to contact the team dealing with NHS charities. Where charities are proposing to link for Registration purposes only. However, even where the form is not to be used, it contains information that trustees might find useful. It may, therefore, be appropriate to suggest that the trustees look at the online form in any case. The trustees can then consider the information attached to the form, to help to understand more about linking charities. If one of the charities holds permanent endowment (PE), linking will not change the status of the PE. The PE must be clearly shown in the accounts as a restricted fund. We need to be sure that trustees are aware of this and of the need to protect the PE. This is particularly an issue where a charitable company is linked to a charity that holds PE. Failing to properly identify and protect PE could result in the PE being distributed to the company's creditors should the company go into liquidation. Where we are asked to advise a charitable company that is considering linking to a charity that holds PE we should stress the importance of protecting the PE. We should suggest that the trustees take their own professional advice to ensure the PE is clearly identified and given as much protection as possible. where the unincorporated charity holds PE. In this case, the PE cannot be transferred to the company and the unincorporated charity will be retained to hold the PE assets. It is for the trustees to decide to retain the shell charity. If they do decide to do this they may want to link the charities to reduce the administrative burden because it is more convenient for shell charities to be linked to the charitable company. Similarly, they may decide to link a charity holding permanent endowment for the same reason. If the trustees decide it is in their interests to link the charities we should ask that they complete the online application form. Using the form will ensure that the trustees are aware of the limitations of linking and that we are given all the information necessary to make the link. Where we are making a Scheme for a charity we might, in the past, have included a linking direction within the Scheme. However, our current policy is that we will not include a linking direction in a Scheme. Instead, all qualifying applications for linking must be made using the online form and we will make the linking direction by letter or email so that this stands outside of the Scheme. This is the case even if we are making a Scheme solely to appoint a corporate trustee that needs to be given trust corporation status. We do this to avoid possible confusion or lack of clarity should the link come to an end in the future. Having a stand alone email or letter means that the charities' records can be easily amended to clearly reflect the circumstances once the link ends. if we have any information that might cast doubt on the validity of the application. We hold information about previous case involvement with charities as well as accounts and annual reports history. We should check applications against our Risk Framework. If there is any question about the validity of the application we should contact the proposed reporting charity's named correspondent to ask if the application is validly made. If not, we should inform the applicant and close the case. The online form asks the applicant to check if the charities to be linked have submitted their most up to date accounts and if not (or if any of the charities fall below the submission threshold) the applicant must upload the accounts with the form before we can consider the case. This is important because aggregating the funds of the linked charities in the reporting charity’s accounts requires the accounting records of the linked charities to be complete and up to date. Similarly, if any of the charities are late in completing their annual return, we should explain that we will not consider the case until the charities have submitted the required documents. We should do this in all cases, unless linking the charities is part of ongoing work that will result in the charities functioning properly, in this case we should use the information in the form to make the link as normal. Once we are satisfied that the application is suitable for further consideration we should look at the contents of the form. The following list sets out the checks we should make and the action we should take. 1. Check the details of the charities to be linked. All of the charities named on the form must be registered charities and must not be NHS charities. If an NHS charity has applied to link using the form (even though there is a question intended to signpost these charities away from the form), we should forward the form to the team responsible for dealing with NHS charities. If there is any doubt about whether or not a charity is an NHS charity, consult a senior colleague and/or the NHS charities' guidance. 2. Decide which section of the Act can be used to make the link. The form asks the applicant to set out the characteristics that the charities share that would allow them to be linked. Our policy is to make the link under s12(2) of the Act whenever possible, this requires the charities to have the same trustees. have the same trustees and are not otherwise connected. We will link under s12(1) only where the charities are connected but do not have the same trustees. Caseworkers should check Register Plus to see if the trustees are the same or, where the applicant has said that the charities are connected, check the governing documents of the charities to see if we agree this is the case. If these criteria are not met, we should contact the applicant to explain that the charities cannot be linked and set out the reasons why not. The decision not to link the charities should be recorded as a formal decision of the Commission. This decision is reviewable by the Litigation and Review team and could be taken to the Charity Tribunal. 3. Consider which charity should be the reporting charity. The form asks the applicant to specify which charity will be the reporting charity. This will usually be the charity with the widest objects (except where one of the charities is a company). If both/all of the charities are unincorporated, we will link the charities in accordance with the applicant's suggestion, unless there are reasons why we think this is not appropriate (for example, if we think this might mislead the public). In that case we should contact the applicant to suggest a different reporting charity. If one of the charities is a charitable company, this should be the reporting charity, in order to comply with company law. In this way, the accounts filed with Companies House will be identical to those filed with us. If there is a charitable company involved and this has not been put forward as the reporting charity, we should contact the applicant, explain the situation, ask if there are any exceptional circumstances why this is the case, and, if not, make the company the reporting charity. If the applicant makes a case that exceptional circumstances mean that the unincorporated charity should be the reporting charity caseworkers should consult an accountant. 4. Additional considerations where two or more charitable companies apply to link. Where two charitable companies are proposing to link, if the combined gross income of the charities exceeds £500,000pa, charity law requires that group accounts are produced. This means that the action of linking the charities (and therefore the requirement to produce group accounts) will not directly result in the charity incurring additional accounting expenses. Because of this we will link the charities without the applicant having to make a specific case. If the combined income is less than £500,000pa there is no statutory requirement to produce group accounts so to do this, because the charities are linked, will incur unnecessary expense which will usually outweigh any advantages that linking might bring. However, there may be particular reasons why the trustees want to link the charities, even with the extra expense this might incur. The form allows the applicant to explain the advantages that linking will bring to the charities. We should consider the case made and speak to an accountant, before deciding if we are prepared to link the charities. If linking is approved this should be for both registration and accounting purposes and the applicant should be advised that they must produce consolidated accounts. Having considered the points set out above, if we are satisfied that the form is correctly completed and that linking will bring benefits to the charities, we should link the charities. Once we are satisfied that linking the charities is possible and appropriate we must make the link in Register Plus, update our other records and inform the charity that we have made the link. The link is formally made when we write to the trustees informing them that, as of the date of the direction, the charities are linked. The text for the direction to include in an email is available in the Model Letters section of this OG. The procedure for linking the charities in Register Plus is available on Connect. Once the link has been recorded in Register Plus, the charities' CeRIS records must be amended to reflect the linking. This involves moving folders and this can only be done by a Local Information Manager (LIM). Instructions about requesting LIM assistance are set out in the document Interim guidance for recording a charity linking. All LIMs have access to additional guidance about updating the CeRIS records of linked charities. The linking direction should be stored in the Key Document folder of the charity that has been linked, with an alias put in the Key Document file of the reporting charity. Where the link involves more than two charities, the original linking direction should be stored in one of the linked charities’ KD folder with an alias placed in the KD folder of the reporting charity and in the KD folders of the other linked charities. Where one of the charities to be linked is unregistered it is still possible to link this to a registered charity. Before we do this we will need to ensure that the objects of the unregistered charity are charitable and capable of being registered. If this is the case we can link the unregistered charity using its Non-Registered Organisation (NRO) number on Register Plus. The unregistered charity will appear under the reporting charity's registered number with the appropriate suffix. Where we are asked to link an unregistered charity we should first of all search Register Plus to see if the organisation has already been recorded and given a NRO number. If so, we should check for duplicate records and remove any duplicates that exist. If there is no record of the organisation, we should create a new unregistered charity with a new NRO number. Once we are satisfied that there is only one Register Plus record for the unregistered charity we should include as much information as possible, particularly regarding the governing document and trusteeship, then link the charities. The process for linking an unregistered charity to a registered charity differs from the process to link two registered charities, the link is not made directly within Register Plus. It is our policy, apart from in exceptional circumstances, to always link charities for both registration and accounting purposes. By doing this we ensure that the accounts and annual return submitted to us match the entry on the Register. The linked charities will be accounted for as restricted funds of the reporting charity. Once charities have been linked in Register Plus for registration and accounting purposes, the reporting charity will continue to receive mailing reminders, the linked charities will not receive reminders. We should only link special trusts where the special trust qualifies for registration (including meeting the income thresholds) and where to do so would be a good use of our resources in the circumstances of the particular case. Where we link special trusts, this will take effect for registration purposes only. Because charity law requires that special trusts must always be accounted for as restricted funds of the main charity, there is no need for our direction to allow this. However, we will use the same wording as we would when linking charities for registration and accounting purposes. This is partly to simplify our procedures but is also to clarify that the charities are linked for accounting purposes even though it is not our direction that makes the accounting link. The form cannot be used to apply for linking for registration purposes only. In the course of other casework, we may come across special trusts that have not been linked (this is particularly likely with charities that have been on the register for a long time). Where we find an unlinked special trust, we may decide that this should be linked to the reporting charity, to ensure the accuracy of the register. If we think that the charities should be linked, we should ask the charity to formally apply in writing, (the online application form cannot be used in this case) we will then link the charities as a matter of course. It is not our policy to link charities for accounting purposes only. This is to ensure that there is a one to one match between a charity's entry on the Register of Charities and its filing/Annual Returns history. Our normal policy is to always link charities with the full co-operation, and on the application, of the charities' trustees. However, in exceptional circumstances, we may decide to link charities of our own motion. This may be where having two separate charities might mislead the public. One example where we considered proactive linking was where two large and closely connected charities filed separate accounts with us but had united these in their annual report. We felt that it was misleading to separately account for two charities that were so closely connected. If there is any question that we might be considering linking charities of our own motion caseworkers should always take legal and accountancy advice. Where charities qualify for linking because they are connected, the linked (or reporting) charity's objects or activities might change to the extent that the charities can no longer be said to be connected. In this case, the link will automatically come to an end, the only action for the Commission is to ensure that our records for the charities properly reflect the position. Where a group of charities re-organises, this might result in there being a different reporting charity. In this case the linked charities will need to unlink and, if appropriate, link to the new reporting charity. Whether or not we need to be involved in bringing a link to an end, we will need to amend our records to reflect the new position. Where we come across this scenario, either because the trustees have contacted us, or in the course of casework, we must amend the formerly linked charities' Register Plus entries and CeRIS records. Where the trustees of a linked charity apply to us to remove a link because they do not want the link to continue, even if the charities still qualify to link, we need to formally bring the link to an end. We will do this in writing. Suitable wording can be found in the Model letters section of this OG. Where the linking direction was included in a Scheme (made prior to our policy not to include linking directions in a Scheme), the 'unlinking' direction will override the clause in the Scheme which linked the charities, there is no need to amend the Scheme. The charity should keep the unlinking direction with the (formerly linked) charity's permanent records. The procedure for removing a link between charities in Register Plus is set out on Connect. Once the link has been removed in Register Plus the charities' CeRIS records must be amended to reflect the new position. This involves moving folders and this can only be done by a Local Information Manager (LIM). The interim guidance sets out how to request LIM assistance in doing this. All LIMs have access to additional guidance about updating the CeRIS records of previously linked charities. The direction formally bringing the link to an end should be stored in the Key Document folder of the formerly linked charity. Where the link was made by email/letter a note should be added to the CeRIS record of the linking direction stating that the direction came to an end on the date that we removed the link. Where the link was made by a Scheme the 'unlinking' direction should be stored in the (formerly) linked charity's Key Documents folder with an alias put in the (former) reporting charity's Key Documents folder. Where a link is removed, the formerly linked charity will be liable for registration, if it qualifies on grounds of income. In this case, the trustees should apply for registration in the usual way and will be given a new registered charity number. This applies whether or not the formerly linked charity was previously separately registered with the Commission. 'Aggregated accounts' by this we mean a set of accounts that reports on all of the separate funds held by the linked charities. The accounting records must show separately the restricted and unrestricted funds of the reporting charity and each of the linked charities. These balances are summarised in the accounts with restricted and unrestricted reported separately. 'Connected charity' where we refer to charities being ‘connected' in relation to linking charities under s12(1) of the Act, we mean charities that provide different aspects of the same overarching charitable service. For example, separate prize funds related to a school or residents' welfare funds administered in connection with a residential care home. The legal definition set out in s12(1) is 'established for any special purposes of or in connection with a charity'. 'Linked charity' this is a charity that is linked to another charity (the 'reporting charity'). 'Linking' this is the action of linking two or more charities. A link is made by a direction of the Commission (formerly called a 'Uniting Direction'). Section 12 of the Charities Act provides a power for the Commission to link two or more charities 'for all or any purposes of this Act'. In practice, we will usually link charities for registration and accounting purposes jointly and we will occasionally link charities for registration only, we do not link charities for accounting only or for any other purposes of the Act. 'Reporting charity' this is the charity that is responsible for producing aggregated accounts for the linked charities and making the appropriate submissions (Annual Returns, etc) to the Commission. The reporting charity will usually be the charity with the widest objects, except where one or more of the charities to be linked is a company, in this case, the company should be the reporting charity. ‘Same trustees’ where we say that the charities must have the same trustees we mean the trustees of all the charities to be linked are either the same named individuals or the same corporate body. Even if a charitable company’s directors (trustees) are exactly the same individuals who are trustees of the unincorporated charity, this does not mean trustees of both charities are the same. This is because the company as a corporate body would become trustee of the unincorporated charity and not the individuals who are the directors of the company. 'Shell charity' this means a charity that carries out no activity except to collect income (often legacies) on behalf of another charity. In the context of linking charities, a shell charity is often an unincorporated charity that remains in existence after the charity has established a new charitable company to take on the function and activities of the charity. If the trustees decide to retain the unincorporated charity it will usually be restructured to permit a single corporate trustee and the two charities may be linked under section 12(1)(a) on the basis that the unincorporated charity is now established for a special purpose of or in connection with the charitable company. the charities are usually able to be linked. The link is made by direction of the Commission under the power given by section 12(1) or 12(2) of the Charities Act. Only charities that prepare accruals accounts under the Statement of Recommended Practice on Accounting and Reporting by Charities ('the charities' SORP') or that prepare receipts and payments accounts under the Charities Act can be linked. Charities that fall under different reporting requirements (for example the Registered Social Housing Providers' SORP or the Higher and Further Education SORP) cannot be linked by the Commission. This is because the mismatch in reporting requirements will mean that the aggregated accounts cannot show a true and fair view of the charities' position. the trustees have submitted a properly completed online application form (where appropriate). We will link charities for both accounting and registration purposes or, occasionally, for registration purposes only but we will not link charities for accounting purposes only. 'The Commission may direct that for all or any of the purposes of this Act an institution established for any special purposes of or in connection with a charity (being charitable purposes) is to be treated as forming part of that charity or as forming a distinct charity'. Within this guidance we refer to these charities as 'connected' charities. While our preference is to link charities under s12(2), whenever possible, s12(1) can be used where s12(2) is not available, because the charities do not have the same trustees. To enable us to use s12(1) the charities to be linked must be connected. 'The Commission may direct that for all or any of the purposes of this Act two or more charities having the same charity trustees are to be treated as a single charity'. Our preference, where the charities qualify to link under both 12(1) & 12(2), is to link charities under s12(2). 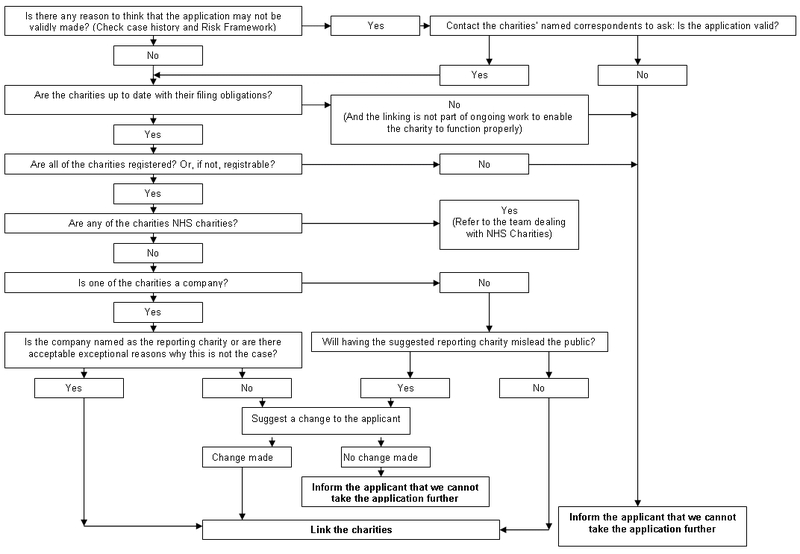 For the Commission, linking charities means we have to process fewer sets of accounts and also means that the Register of Charities gives a clearer picture of how a charity is being administered. While linking charities will provide some benefits to charity trustees, there are common misconceptions about what linking charities will achieve. It is important that the trustees are aware of the limitations of linking. How charities are set up affects how they are linked and how the accounts are prepared. Where two or more unincorporated charities are looking to link, the online application form will ask if the trustees of the charities are the same. Where this is the case, we will link the charities under s12(2) of the Act. If the charities do not have the same trustees, the application form asks the trustees to confirm that the charities are connected. In this case, if we agree that the charities are connected, we will link the charities under s12(1) of the Act. Where the charities fulfil both conditions we will link under s12(2). Where one of the charities is incorporated, (usually as a charitable company) the incorporated charity should usually be the reporting charity. It is a requirement of company law that a company submits annual accounts. However, where an unincorporated charity, which holds permanent endowment (PE), sets up a charitable company to take over its assets and function, the trustees must take proper steps to ensure the PE is clearly identified and properly protected. The property of the PE charity must be reported in the company's accounts as a restricted fund (endowment). This should minimise the risk to the PE should the company go into liquidation. We do not, apart from in exceptional circumstances, link an incorporated charity to an unincorporated charity, where the unincorporated charity is the reporting charity. This is because of the mismatch between the annual accounts filed with the Commission for the linked charities and the annual accounts filed, by the charitable company only, with Companies House for which we would not have a matching entry on our register. If we are asked to make this kind of a link, caseworkers should ask a Commission accountant for advice. In this guidance, when we refer to an ‘incorporated’ charity we mean a charitable company. We may, however, be asked to link charities where one or more of the charities is incorporated in another way, for example, by Royal Charter. If we are asked to link charities where one or more of the charities is governed by Royal Charter caseworkers should consult a Commission accountant and/or lawyer. Further information about the kind of issues faced by charities governed by Royal Charter can be found on our website. The online form asks the trustees to decide which one of the charities will be the reporting charity. This will usually be the charity with the widest objects (unless one of the charities is a company). The reporting charity will be shown on the Register with its registered charity number and the linked suffix '0'. The charities which are linked to this will be displayed under the reporting charity's registered number with a linked suffix '1', '2', etc. The Register will also display the unique organisation number attached to each linked charity. A special trust might come about when a donor makes a gift to a charity for particular purposes that are more limited than the purposes of the charity. For example a gift to a healthcare charity with a stipulation that the funds should be used only for the care of the elderly. need not submit its own accounts and reports; its income and expenditure must be accounted for as a restricted fund in the accounts of the main charity. A charitable company cannot hold special trust property as part of its corporate property but it can act as trustee of a special trust. Where a charitable company is trustee of a special trust we will link the special trust for registration purposes (and include the accounting wording as above). Before doing this, we must ensure that the trustees of the charitable company are aware that the property of the special trust remains separate and will not form part of the corporate property of the charity. This is particularly important in case the charitable company goes into liquidation. Where a charity which was formerly excepted is now required to register because of the ending of the excepting regulations, any special trusts associated with this charity also become registrable and should therefore be linked. However, if the income of any of these special trusts falls below the excepted charities' registration threshold (£100,000) this will not be liable to separate registration, this means there is no need to link this to the reporting charity. The special trust can already be accounted for by the main charity. Even though excepted charities are not required to register with the Commission, they are subject to the other requirements of the Charities Act (apart from those relating to the submission of accounts, the preparation and transmission of annual reports and the completion of annual returns). This means that excepted charities can be linked to other charities, if they would otherwise qualify for registration. Where linking involves an excepted charity we will only do this for both accounting and registration purposes. Where an excepted charity is to be linked to a reporting charity that is not excepted, we will link the charities without insisting that the excepted charity registers. However, if the excepted charity is to be the reporting charity, this will have to register before we make the link. This is because the reporting charity needs a registered charity number before a link can be made. See B5 for more information about the process involved here. If all of the linked charities are excepted under s30(2)(d) because each charity's annual income does not exceed £5,000, the charities will only continue to be excepted if the total income of the linked charities is less than this threshold. If the total income of all of the linked charities exceeds £5,000pa then the charities are no longer excepted under s30(2)(d) and will need to register. If the reporting charity qualifies for registration, any excepted charities that are linked to this charity will no longer be excepted because of the link. Even though we do not link exempt charities, an institution can, under paragraph 28 of Schedule 3 of the Charities Act, be connected to an exempt charity, this is called a ‘connected institution’. A charity that is connected to an exempt charity would, because of this connection, itself become exempt. Further information on connected institutions can be found in OG717-2. When preparing accounts for linked charities, trustees must follow the reporting requirements of the Charities' SORP, where those accounts are prepared on an accruals basis. Trustees should take their own professional advice if they have particular queries about accounting for linked charities. The funds of the linked charities will be restricted funds when reported in the reporting charity's accounts. If the reporting charity is a charitable company and one (or more) of the linked charities is also a charitable company, the accounts must take the form of consolidated or group accounts. Where none of the linked charities is a charitable company, the form of accounting is normally branch accounting. The funds of the linked charities will be shown as restricted funds within the accounts of the reporting charity. The reporting charity will then aggregate the funds of the linked charities when reporting the overall performance of the charity. If the charities to be linked prepare receipts and payments accounts and their combined annual income exceeds £250,000 they will be required to prepare accruals accounts once they have linked. Where linking involves permanent endowment or special trusts, where these are not separate charities for accounting and reporting purposes, they should be reported as restricted funds of the reporting charity. Where the reporting charity is a charitable company; in the event of winding up, only the unrestricted funds of the company should generally be available to all creditors. Where a charitable company is trustee of a charity that holds permanent endowment this PE would not be available, as corporate property, to any of the creditors of the company on winding up. The trustees of the PE charity should ensure that the PE is clearly identified and adequately protected, taking professional advice if appropriate. There are a number of different accounting Statements of Recommended Practice (SORP) that might apply to charities, for example, the Housing SORP or the Higher and Further Education SORP. We cannot link charities that report under any SORP other than the Charities' SORP. This is to ensure that the accounts give a true and fair view of the activities of the linked charities and this is unlikely to be possible if the charities are expected to report under different accounting and reporting regimes. Linking is the creation of a link between two or more closely connected registered charities. The link is made by the Commission and the Register of Charities is updated to show the link. Linking means that two or more charities need produce only one set of financial statements, produce one Trustees' Annual Report and have only one registered charity number. (where one of the charities is a company) avoid the necessity to comply with Companies Act requirements. In order to link, charities will need to have the same trustees and/or be otherwise connected. Yes, CIOs can link with other charities, as long as they qualify. Where a CIO is formed to take over the assets and function of an unincorporated charity that holds PE, the CIO regulations contain provisions which mean that the CIO is automatically linked to the PE charity, without the need for a direction from the Commission. In other cases, the charities will need to apply for linking in the usual way. No, because exempt charities do not need to comply with the registration and accounting requirements of the Charities Act there would be no benefit in linking exempt charities (see E13). We can accept an application to link charities from someone who is authorised to act on behalf of the trustees of all the charities involved. This might be a trustee, employee or professional advisor. Linked charities will be shown on the Register of Charities under the title 'Linked Charity'. The charity number will display the reporting charity's registered charity number with a linked suffix number unique to the linked charity (for example 123456-01). The reporting charity will be shown on the Register of Charities under the title 'Reporting Charity' and will display the reporting charity's Registered charity number together with the linked suffix number 0 (for example 1234546-00). Thank you for submitting the completed application form to link the charities named above. I am pleased to confirm that I have now linked the charities. Subject to any further direction, the Commission directs that as of [insert date] the charity/charities [known as/called ##] ('the linked charit[y][ies]') shall be treated as forming part of the charity [known as/called ##] ('the reporting charity') for the purposes of Part 4 (registration) and Part 8 (accounting) of the Charities Act 2011. This direction takes effect for the whole of the financial year of the reporting charity in which it is made. until such time that the charities [no longer have the same trustees] [are no longer connected]. where accruals accounts are prepared, the charities' Statement of Recommended Practice (SORP) must be used. The linking of the charities under section 12   is an administrative linkage, for reporting purposes only. It does not change the separate legal status of the charities, or the nature of restricted funds or endowment, and it does not constitute a merger. The trustees are under a duty to ensure that the funds of each charity are still applied solely in accordance with the respective trusts. The charity [known as/called ##] has been identified as the reporting charity. The trustees of the reporting charity must maintain separate accounting records for each linked charity and ensure that the funds for each charity are applied only in accordance with each charity's separate trusts. This is a requirement of section 130 of the Charities Act 2011. The trustees' annual report must include a description of the funds held by each of the linked charities. with the notes to the accounts providing information on the structure of the funds for both the reporting charity and the linked charity. It must include an analysis of the assets and liabilities of each fund held by the reporting charity and linked charity with any material individual funds separately shown. These are requirements of paragraphs 74 and 75 of the charities' SORP. Should the link come to an end because the terms on which the link is made change, the trustees are under a duty to inform the Commission of this as soon as possible. This is so that we can ensure that the Register of Charities is properly updated. 'The Commission directs that, as of [insert date], the administrative link between the charities [known as/called ##] which was made by direction of the Commission dated ##/##/### no longer has effect. This applies for the first complete reporting period following the date of this direction.